Store bought, mass produced barbecue sauces are often made with gluten, soy, preservatives and artificial flavorings. By making your own quick and easy barbecue sauce you have greater control over what you are eating. 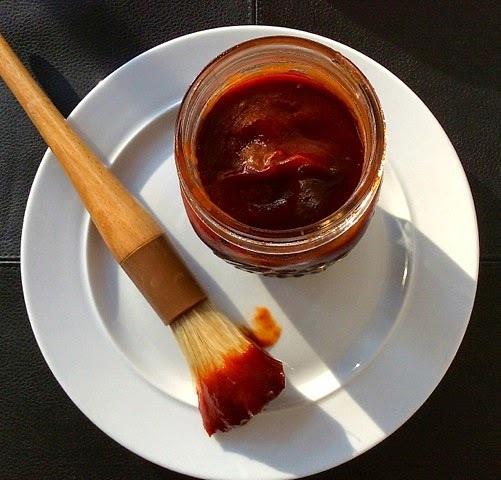 This GF "Sweet and Tangy Barbecue Sauce" does not use any refined sugar or corn syrup, but will still bring plenty of flavor to your meat, poultry, fish and veggies; so go ahead and cook up a big batch to be sure to have enough to last you awhile! 2 cups organic (GF) tomato sauce Note: I like both the Amy's and Muir Glen brands but you can chose any favorite you have. Pour into a medium sauce pan and bring to a boil over medium high heat. Your BBQ sauce sounds delicious and it's so wholesome too! I like the addition of the Balsamic vinegar. Thank you for sharing your recipe with us at the Hearth and Soul Hop. That looks like a sauce I'd love to have on my plate! And, since I haven't had nearly enough tangy barbecue sauces lately, I think I'll be making some of this soon. Can I ask what brand of molasses you like to use?